Get away to spectacular sea views, the warmest welcome and excellent breakfasts at our recently renovated 4 star Georgian Guesthouse on the edge of The Snowdonia National Park. 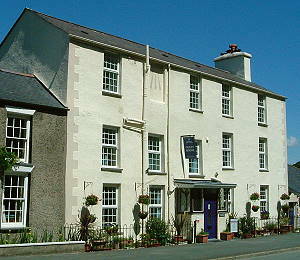 With spectacular views across Cardigan Bay and only minutes walk to a beautiful blue flag beach. We are centrally located to many attractions. Unwind in great scenery in the "land that time forgot". We are ideally located for walking, cycling, bird watching, fishing, and to many other attractions. Visit the Blue Lake, an old slate mine, with it's magnificent views over Fairbourne and Cardigan Bay. Alternatively take a gentle stroll along the beach to Penrhyn Point, or a longer walk to Barmouth bridge, across the most beautiful Mawddach Estuary (featured on BBC's Coast) into Barmouth or join the Mawddach trail (featured on Julia Bradbury's Railway Walks") to Dolgellau. We are on the other side of the Bridge from Barmouth and 3 minutes drive from Morfa Mawddach Station which is the start of the Mawddach trail. Fairbourne boasts its own narrow gauge railway, which also links to a small ferry to Barmouth. Alternatively take a longer walk up Cader Idris to Snowdonia's second highest peak. Other attractions include, pony trekking, The Centre for Alternative Technology, Electric Mountain, Coed y Brenin biking centre, Harlech Castle, Tal-y-Llyn Railway, Bala Railway, Port Merion, Snowdonia, Lloyd George Museum, Powys Castle, Bodnant Gardens. Alternatively use us as a bolthole, from the grind of daily life, for short breaks to allow you to just rest and relax and soak up the spectacular scenery. We are close to the amenities of Fairbourne, bus routes to Dolgellau and Aberystwyth, and mainline train services from Fairbourne Station on the Cambrian Coast Line. 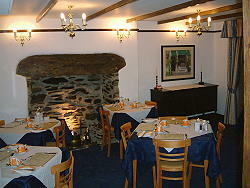 All rooms are ensuite with tea and coffee making facilities, TV, alarm clock, hairdryer, books. We are non smoking but guests are welcome to use the Garden. We have a licensed bar from 7pm, and drinks can be served in the Garden or in your room. If you have any disability please ask us to send you our access statement which describes the facilities of Einion House. We offer a packed lunch and can fill your flask with tea and coffee for the day if required. From the A470 Dolgellau Bypass, take the A493 towards Tywyn. Proceed for 8 miles, passing through the picturesque villages of Penmaenpool and Arthog. On entering Friog, Einion House is half a mile on the right after the filling station. Off-road parking is opposite the guest house.